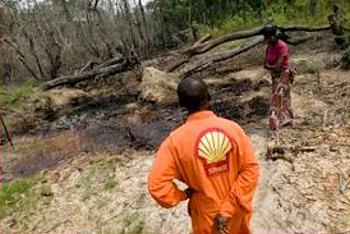 THE HAGUE, The Netherlands, January 30, 2013 – A Dutch court ruled today that Shell is responsible for not preventing the pollution of farmlands at Ikot Ada Udo in Nigeria’s Akwa Ibom State and ordered the company to pay compensation for the damage. The case was brought by Friends of the Earth Netherlands and four Nigerian farmers in 2008 against the Shell Petroleum Development Company of Nigeria Ltd. and its parent company Royal Dutch Shell. This is the first time that Shell has been ordered by a court to pay compensation for damage caused by its operations. The Nigerian justice system has never produced such a ruling. The case is unique because it is the first time that a Dutch multinational corporation has been brought before the court in its home country for environmental damage caused abroad. 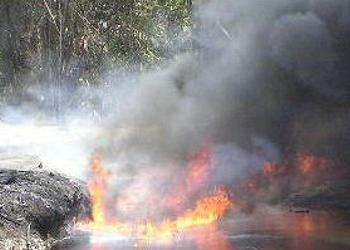 The case focused on just three of the thousands of oil leaks in Nigeria. The plaintiffs demanded that Shell clean up the oil pollution in the villages, compensate the farmers for the damages suffered and maintain the oil pipelines better in the future. “This win for the farmers of Ikot Ada Udo has set a precedent as it will be an important step that multinationals can more easily be made answerable for the damage they do in developing countries. We anticipate other communities will now demand that Shell pay for the assault on their environment,” said Friends of the Earth Nigeria’s Executive Director Nnimmo Bassey, who played a pivotal role in bringing to light the havoc wreaked by Shell in the Niger Delta. The ruling is a victory for Nigerian people and the environment, said Geert Ritsema of Friends of the Earth Netherlands, or Milieudefensie in Dutch. “This verdict is great news for the people in Ikot Ada Udo who started this case together with Milieudefensie. But the verdict also offers hope to other victims of environmental pollution caused by multinationals,” he said. Friends of the Earth Netherlands and the Nigerian farmers will appeal the decision in the Goi and Oruma cases. The plaintiffs will also appeal the principle point of the liability of the Royal Dutch Shell parent company. Royal Dutch Shell owns 100 percent of Shell Nigeria shares, while Shell Nigeria profits estimated at 1.8 billion euros annually, are deposited in the Netherlands. Nevertheless, under existing laws, Royal Dutch Shell cannot be held liable for the damage done on the basis of these facts alone. The plaintiffs must prove that governance actually comes from the corporate headquarters in the Netherlands. Because Shell has not been ordered by the court to allow access to internal company documents which would expose this governance, it has been very difficult to prove this. Friends of the Earth Europe is urging the European Commission to ensure that parent companies are automatically held liable for the actions of their foreign subsidiaries. Next week, on February 6, the European Commission will discuss with stakeholders steps it can take to limit the adverse human rights and environmental impacts of business. Friends of the Earth Netherlands finds it “incomprehensible” that the court ruled that Shell proved sabotage was involved in two of the three villages. The court has allowed itself be convinced by a number of blurry Shell photos and poor quality video images. The environmental group remains convinced that poor maintenance is the cause of the spills. But even in oil spills where sabotage is involved, the group believes that Shell bears responsibility and is liable for the damage. “An oil giant cannot leave 7,000 kilometres of pipeline and hundreds of installations unprotected and unguarded in a politically unstable and economically underdeveloped region,” said Ritsema. Plaintiff Chief Eric Dooh lost his farm and fish ponds due to an oil spill from a Shell Nigeria pipeline. 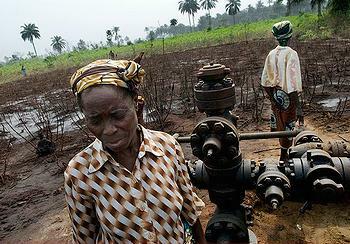 An oil disaster has been ongoing in Nigeria for decades. Tens of millions of barrels of oil have been spilled there since the 1950s. Friends of the Earth Netherlands says that Nigeria’s oil spill disaster does not receive the attention it deserves, in contrast to other oil disasters such as the Exxon Valdez tanker in Prince William Sound Alaska or the Deepwater Horizon in the Gulf of Mexico, where there was massive public outrage that resulted in an emergency plan. The Niger is the third-largest river in Africa and the oil-rich Niger Delta region, with its mangrove forests, is one of the world’s largest wetland areas. But now a black layer of oil covers many of the Niger Delta’s creeks, ponds, mangroves and rivers. Many of the region’s animals are threatened, including chimpanzees, leopards and elephants. Niger Delta residents experience the burdens of oil extraction, but reap no benefits. Most are dependent on agriculture, fishing and fish farming and gathering snails and other products from the forests. For them, oil pollution means a lack of drinking water, inedible fish, agricultural fields that must lie fallow for years and crops that never grow. In August 2011, the UN Environment Programme issued the results of its 14-month investigation covering more than 200 locations, 122 kilometres of pipeline rights of way, more than 5,000 medical records and talks with 23,000 people at local community meetings.